LOS ANGELES, CA - 10/19/2016 (PRESS RELEASE JET) -- For the first time in nearly twenty years, Francisco Flores gazes at a photograph of himself without tattoos. He shakes his head and, after a long pause, mutters a simple, “wow.” The fading ink that can be seen on his face, neck, and arms was from a different time—but it continues to impact his life. Tattoo-removal is a painful and difficult process that typically takes years to complete, but Flores is one of the participants in a new series from Photographer Steven Burton. 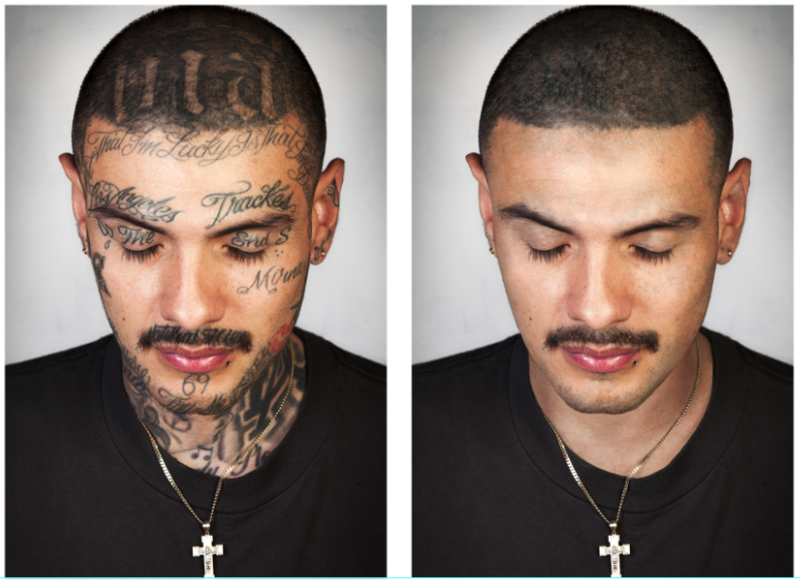 Inspired by the tattoo removal services provided by Homeboy Industries—a nonprofit that helps formerly gang-involved men and women rebuild their lives after incarceration—Burton took striking photographs and then digitally removed tattoos participants’ tattoos. Burton spent two years and nearly 400 hours of Photoshop to complete the series, which includes the side-by-side depictions along with the harrowing but hopeful stories shared by each person portrayed. “The end goal is to spread awareness of the struggles of ex-gang members,” Burton says, adding that he hopes to educate the public by promoting empathy.